When I started training back in February 2010, I was sold on the idea that achieving the advanced barbell strength standards was the key to a muscular physique. In this article, I will discuss whether strength equals size and also give you some realistic expectations for what kind of numbers you can achieve on the big compound exercises if you have below average genetics. The idea behind the standards is that strength goes together with total bodyweight. A guy who weights 200 pounds will on average be much stronger than a guy who weighs 170 pounds. Overall, these graphs are excellent barbell strength standards for the average guy who starts training before age 30. Within 5 years of proper strength training, the average guy can reach the advanced barbell strength standards on every key lift. Bench press 255 pounds (116 KG) for 1 rep.
Press 155 pounds (70 KG) for 1 rep.
Squat 340 pounds (155 KG) for 1 rep.
Deadlift 410 pounds (186 KG) for 1 rep. Bench press 290 pounds (132 KG) for 1 rep.
Press 175 pounds (80 KG) for 1 rep.
Squat 390 pounds (177 KG) for 1 rep.
Deadlift 460 pounds (209 KG) for 1 rep.
Below, I will give you a simple method that you can use to estimate your lifts after 5 years of consistent strength training. 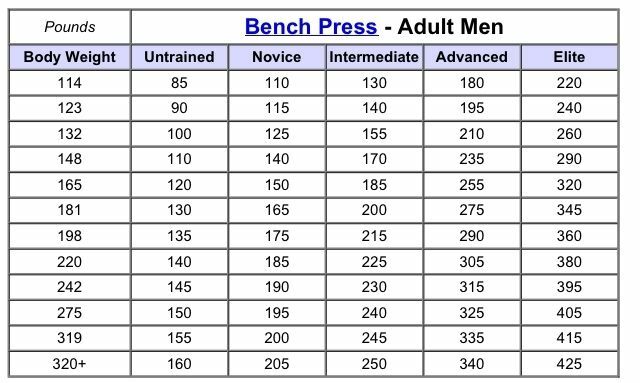 When looking at barbell strength standards, a lot of guys make the mistake to look at what their lifts should be at their current bodyweight. You have a normal body-fat percentage. Therefore, when finding your 5 year strength training goals, you will need to first predict what your healthy bodyweight at 10-15% body-fat will be after 5 years of strength training. For example, if you’re 190 CM tall, you can expect to be 90 KG at 10-15% body-fat after 5 years of strength training. Remember, muscle mass weighs a good amount and you can expect a good 10 KG (22 pounds) to 18 KG (40 pounds) increase in muscle mass over 5 years of strength training. There will of course be some variation in your final bodyweight. Guys with thicker bone-structures and higher body-fat levels will weigh more while guys with thinner bones and lower body-fat levels will weigh less. In addition to this, there will be other factors such as your training, diet, unique response to training and overall consistency throughout those 5 years. Therefore, your final bodyweight will most likely be higher or lower than your target bodyweight, but your target bodyweight is the best prediction you can make right now. Step 2: Look at the advanced barbell strength standards for your target bodyweight. This is what you can expect to lift after 5 years of strength training if you’re genetically average and you started strength training before age 30. Will Guys With Below Average Genetics (e.g. skinny-fat) Be Able To Reach The Advanced Numbers? When looking at the tables above you have to keep in mind that they were designed with the genetically average guy in mind. Most skinny-fat guys are genetically below average, therefore the numbers you will be able to reach are slightly lower compared to the average guy. The best way to see how good your genetics are for strength gain on each lift is to look at your starting strength levels. I.e. how much can your squat, bench press, deadlift and overhead press on the first day you enter the gym? Then compare your starting strength with the untrained barbell strength standards. When comparing barbell strength standards, we want to use your healthy bodyweight to ensure that we don’t get skewed numbers that are too high. 3) Compare the untrained barbell strength standards to your real starting strength numbers to see how genetically gifted you are for strength training. If you’re skinny-fat, chances are that your starting strength is far below the untrained standard. However, this shouldn’t discourage you from getting strong on the compound lifts. When I started training in February 2010 I was a skinny-fat 198 pounds (90 KG) at 6’2” and my healthy bodyweight at 23 BMI was 82 KG (180 pounds). 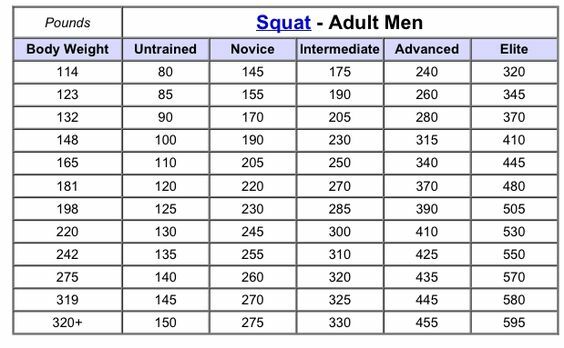 Here are the barbell strength standards for an untrained guy at 181 pounds (82 KG). Bench press 130 pounds (59 KG) for 1 rep.
Press 80 pounds (36 KG) for 1 rep.
Squat 120 pounds (55 KG) for 1 rep.
Deadlift 150 pounds (68 KG) for 1 rep. Overall, my total strength on the 4 key exercises was just 60% of the average untrained guy at my bodyweight. My starting overhead press was 33 pounds. My starting bench press was 75 pounds. My starting squat was 75 pounds. My squat and bench press were both weaker than an untrained woman at the same bodyweight as me. My weakest lift, the press was 33 pounds (15 KG) which is almost the same as a petite, untrained 97 pound (44 KG) woman. My strongest lift, the deadlift was just 117 pounds (53 KG) which is the average for an untrained 132 pound (60 KG) guy who is 66 pounds (30 KG) lighter than me. As you can see, on 3/4 lifts I had the starting strength levels of an untrained female. I was clearly on the low end of the genetic spectrum for strength training (probably bottom 1%). Despite having bad genetics, I made good progress in my strength training. By looking at these numbers, you will see that my gains were good when considering my genetics. I was on average 82.5% as strong as the average advanced lifter. And I’m certain that I could get to 95% of the advanced strength numbers if I continued training for a stronger bench press, squat, deadlift and press. (I stopped focusing on squats, deadlifts and bench presses after just 1 year of training). As a result, I believe that regardless of how bad genetics you have, you can get very close to the advanced strength training standards for your bodyweight. Now the big question is whether it’s even worth it to chase big numbers on the compound exercises? Will Reaching The Advanced Level Make You Look Jacked? While some people train because they want to get stronger, we have to keep in mind that most people reading this website are skinny-fat guys who want to build a great physique. And when it comes to that, a lot of skinny-fat guys have been sold on the idea that reaching the advanced numbers on the bench press, deadlift, squat and press is the key to a great physique. Let me tell you this: If you’re a skinny-fat guy doing heavy barbell lifts with any other reason than simply getting stronger on these lifts or competing in powerlifting, you will get disappointed. These progress photos summarise my physique progress while gaining all my strength on the big compound lifts. When I saw these progress photos I was disappointed. I had gained a lot of strength (nearly 800 pounds on the 4 main lifts) but a minimal amount of muscle mass. I felt like my training time was wasted and I even started to believe that I simply don’t have the genetics to get a great physique. So what is the conclusion of this post? If you’re a skinny-fat guy who trains to get stronger on the squat, bench press, deadlift and press then by all means follow the basic, proven compound programs such as MadCow 5×5 and Reverse Pyramid Training. They will get you close to the advanced level on all those lifts. With that said, I know most of you don’t care about what your lifts are because you train for aesthetics. If you train to gain muscle mass, the big compound lifts are not the best way to go about it. In 5 years of running this website I’ve coached hundreds of people and emailed with thousands. Most of them had previously used heavy barbell training, but similarly to me they never got results with it. 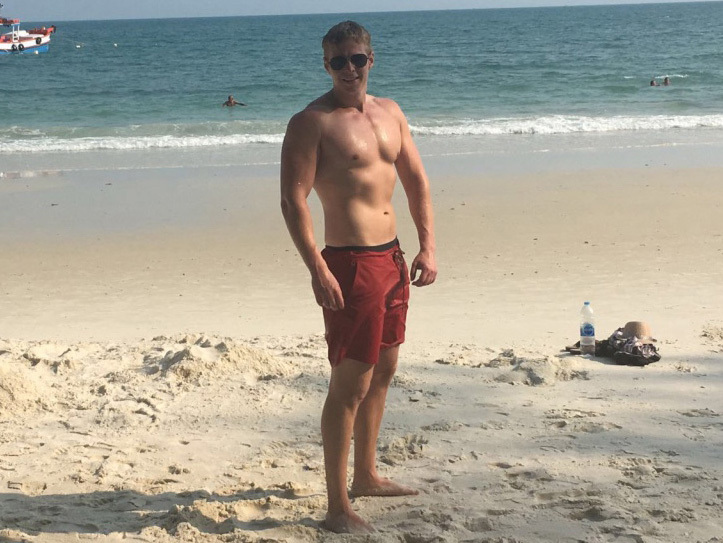 I wasted nearly two years so far with Starting Strength/Stronglifts type routines, and all I got was fat with very little to show for it.I went from about 140lbs to 198 (at 5’8) on that routine. I looked better BEFORE I started it. I also made very little strengths gains to go along with it, which makes it even work. At least you made some strength gains. I kept convincing myself that if I just eat a little more, I will make progress. I would get fat and cut then start it all over again. I am only a week in to another one of these viscous cycles. I had myself convinced that I just need to eat more than I ever did before, then it will finally happen. Only a week and half in, and my lifts are stalling again, I gained 5 pounds (probably fat), and I already injured my knee from squats. I’ve had enough!I am going to use all the info from your site.Thanks again for sharing your experiences. To this day, I still haven’t seen a single skinny-fat success story on a minimalist program that focuses on the squat, bench press and deadlift. (I didn’t include the press here because I believe this is one of the best lifts skinny-fat guys can do). In my case, getting stronger on the deadlift, squat and bench press mostly helped me build up the posterior chain muscles: Thighs, glutes, spinal erectors and traps. These muscles are important for building an overall functional and strong looking physique. However, these are not the muscles that transform your upper body proportions. The muscles that make the biggest difference are the lats, upper back, biceps, triceps, shoulders and upper chest. These are the 6 most important muscle groups for improving your aesthetics. To grow these muscles to their maximum potential, you have to perform exercises where you can really feel those target muscles working. I emphasise really, because most compound exercises will make you feel all muscles working to some extent. That’s why they’re called compound exercises. They work a lot of muscles at the same time. For example, if you perform bench presses, you will most likely feel the chest, shoulders, triceps, forearms and even lats working to some extent. But compare the triceps activation on the bench press to performing rope pushdowns or diamond push ups and you will understand what I mean. Compound exercises are great if your time is limited, but if you’re looking to maximise the size of a muscle that doesn’t respond well to training, you will not make that muscle respond by doing an exercise that “somewhat” activates it. If you’re a skinny-fat guy with a low response to training, the only way you will maximise the size of your weak muscle groups is by doing exercises where you REALLY fell those muscles working. And you have to do these exercises often, when you’re fresh and at a high volume. For example, if you don’t really feel your triceps working on bench presses, you will not see great gains by adding another 50 pounds to your bench press max. But you may very well see great gains by changing your main compound movement to weighted dips. Or by doing 3 arm days per week where you blast the arms with a variety of isolation exercises and high volume training. The same principles apply to all your weak muscle groups. Also, for maximum muscle growth, it’s important that you do the most effective exercises first and that can often conflict with your goal of increasing your squat, bench press and deadlift total. For example, if you go in 3 times per week to squat heavy, you won’t have the energy needed to properly train the muscles that you want to grow the most. When you start on the exercises that really work your muscles, you will already be drained from the heavy squatting. You need to think of your training in terms of limited energy. You only have so much energy and the compound lifts can drain anywhere from 60-100% of your energy. If the compound lifts aren’t growing the muscles you want to grow, your training is not leading you closer to your goal. In my case, nearly all of the growth I made on my upper body comes from doing basic bodyweight training and isolation exercises for moderate-high reps.
To be specific, I trained with much higher volume and tried to make the weight feel harder so I could get a better pump and mind-muscle-connection using less weight. Increasing the amount of weight your lift on the big compound lifts is not the only (or even the best) way to gain a lot of muscle mass. Contrary to popular belief, high volume and pump training methods do not only work for bodybuilders on performance-enhancing-drugs and guys with great genetics. They work for everyone as long as they’re applied the right way. If I had continued focusing on increasing my squat, bench press and deadlift, I wouldn’t have made those gains because my energy would have been depleted. Therefore, the main takeaway is that: If your goal is to develop a muscle to its maximum size, you need to train that muscle often with high volume and with exercises that really make that muscle work. The popular compound training programs accomplish the goal of training muscles often, but the volume is too is limited and the exercise selection is not optimal for most people. I hope it saves a lot of people time and effort.